Mc Grath Foundation "Pink Afternoon Tea"
This Year’s Bob Royal Memorial – Lions Fishing Comp was a great success raising $4,000.00 for the four junior sporting associations on the Peninsula. The success would not have been possible without the many sponsors who came on board to support this event. 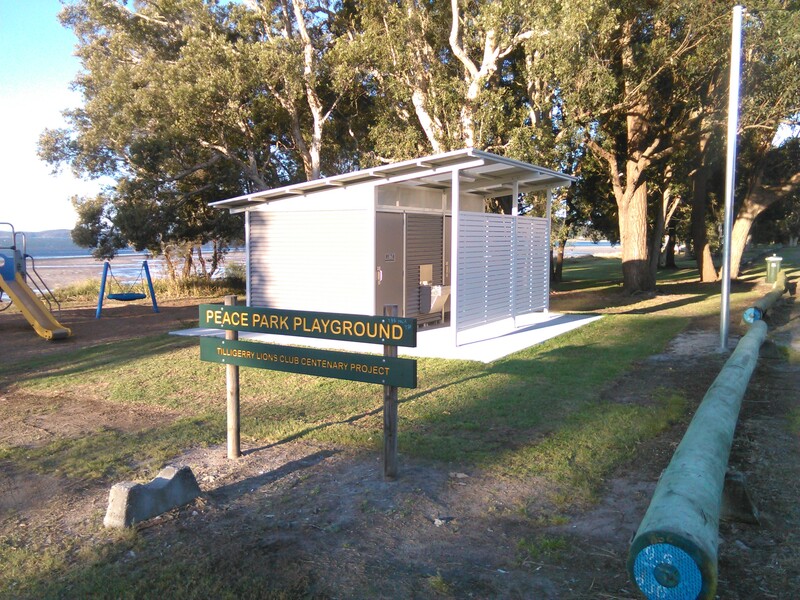 This project had its beginning in October 2016 with discussions between Tilligerry Lions, the local councillor and the mayor as well as in depth ongoing discussions with the Engineering Department of Port Stephens Council. •	A ‘mud map’ outlining the future layout of Peace Park Reserve was drawn up by Tilligerry Lions (refer Attachment A). This 'mud map' is now the blueprint adopted by Council. •	Council agreement to the naming of Peace Parade Playground as the Tilligerry Lions Club Centenary Project. The sign was erected in January 2017 together with the replacement of the previous playground equipment (refer Attachment B). Tilligerry Lions contribution was $4000. •	Council advised that they will replace the existing toilet block (to be actioned 2017/2018). Tilligerry Lions was advised on June 23 2017 of a $ for $ grant (GA 1830) from the Australian Lions Foundation. In turn, Tilligerry Lions advised Council of our commitment of $9200 for the supply and erection of 4 sets of tables/seats (seating for 32). An on-site meeting to discuss exact positioning of all items and landscaping for the Centenary Project has been arranged. A letter to Mayor McKenzie (July 6), seeking Council to cover the cost of a concrete slab (approx 7.5m x 2.5m) valued at $9000. Council support of our project, for inclusion in our successful grant from the Australian Lions Foundation, is attached for your information. Tilligerry Men’s Shed and the Lions Club have “buddied up” in a joint project to provide Buddy Benches for the students of Tanilba Bay Public School. The student parliament had decided that Buddy Benches would be very useful in their school’s Positive Behaviour for Learning and Student Welfare programs. Their Prime Minister met with the Men’s shed to see if they could help out by building two suitable playground benches. After some on-line research, the parliament had decided on a design and appropriate colours so that the benches would be highly visible in the playground and the Men’s Shed members accepted their challenge. 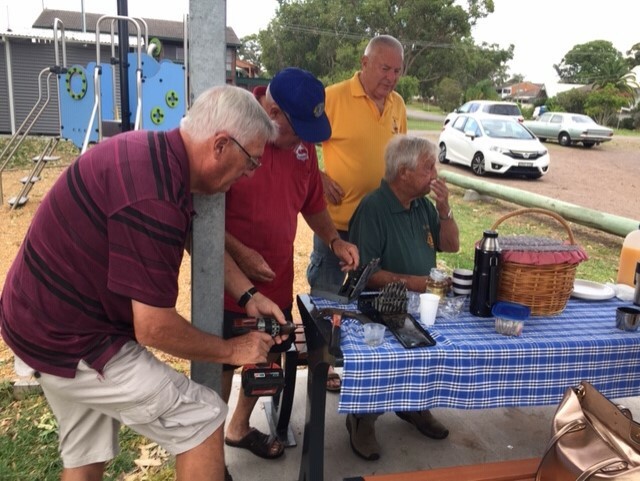 The Men’s Shed then approached the local Tilligerry Lions Club who agreed to assist with funding the materials and other costs. Two months later representatives of both the Men’s Shed and Lions delivered the benches to the school for the handover to the school parliament. The students were very impressed with the finished product. “ Wow,, they are excellent..very impressive. Children who feel lonely or are worried about something can now have a place in the playground where they can go. A senior student, or buddy, can then easily see them and go comfort them or assist them to find someone to play with... thank you so much.. they are just what we wanted.” school Prime Minister Victoria said. School Principal, Stewart Wiley was equally impressed and was the first to try the benches out ..”just to make sure they can take the weight” was his excuse. Studied Welfare & the greater part of her life has been working in the Welfare Sector - Welfare Manager & Coordinator of Emergency Services and Support Work for a homeless men's facility and is a Lifelong Cher fan. The club continues to attract outstanding guest speakers to their monthly meetings. At the July meeting, Brian Hughes, the Hunter Local Land Services estuary and marine officer, spoke of the new developments in the oyster industry. Under the Hunter Regional Oyster Industry Project the Land Services organisation is providing funds to help farmers replace timber infrastructure, with longer lasting materials to reduce waste generation, among other innovations . Mr Hughes announced that 8 oyster farmers from Port Stephens and Karuah will receive grants of $5000 to upgrade their infrastructure and practices to achieve greater sustainability into the future. At the August meeting the members were introduced to an innovatory new business model when Ms Sarah Fenton spoke of her role as a Mobile Travel Agent. A graduate in Science from Newcastle University, she had worked in a Military Hospital in Saudi Arabia, acted a tour director before establishing her new business. It is underpinned by the concept that she will travel to meet her clients at a place and time suitable to them rather than them having to fit around business hours which may not necessarily be suitable. A tentative approach has been made to a researcher to speak at the September meeting regarding Alzheimer's disease. This is a great club event for club members and their families. Opera by the Lake is back again on 4th March 2017 at Tuncurry, NSW located on the beautiful Mid North Coast. Get a group together and join us for a fabulous day or weekend. Go to www.operabythelake.com for more information. There is plenty of accommodation available if required. .....March is a beautiful time of the year. There is so much to do, see and explore in the Great Lakes Region. This year's event was a sellout with a capacity audience. 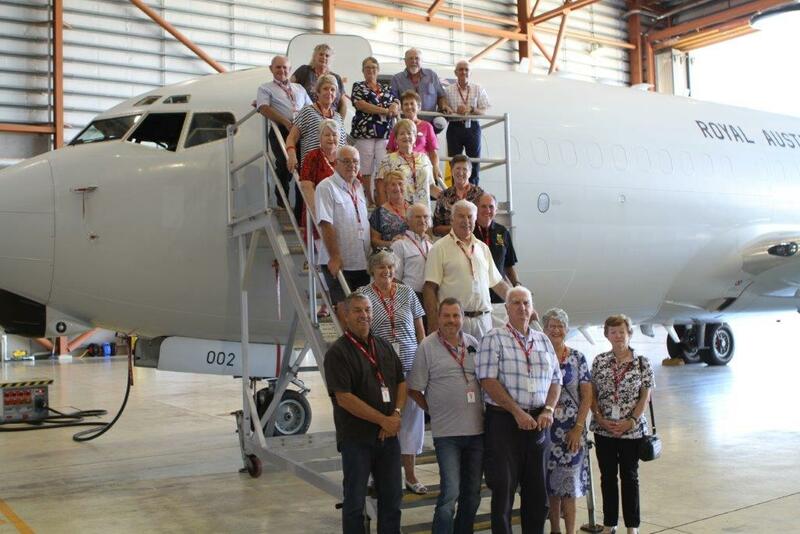 The event attracted patrons from all over the NSW and interstate. Trained Hearing Dog arrives at Lemon Tree Passage. Fizz,a Heinz variety rescue dog, is now a certified carer dog. FIzz underwent an 8 month training course - 7 month basic training at Hindmarsh SA and 1 month at home in Lemon Tree Passage. The cost of training typically amounts to $30,000 per dog. All costs are met by Lions International with, in this case, a major contributor being Tilligerry Lions who donated $3,000. Look out for Fizz wearing his special coat.